Just how should we view Christopher Columbus? The 5th graders in Mr. Salk's U.S. History class have been thinking about this very issue. 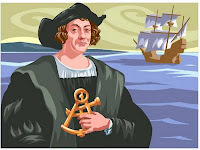 After learning about the heroic aspects of Columbus - he was certainly an accomplished sailor who exhibited much persistence and courage, and he kicked off the Columbian Exchange (for better or worse, depending on whose perspective one takes), they discovered that he was also a selfish, ruthless man who lied, maimed, and killed to get what he wanted. Students were asked to situate their opinion of Columbus along a continuum, from villainous to heroic. After much discussion and debate, each student reassessed his/her opinion. The net results: most of the students felt more positively towards Columbus after listening to what others had to say, although overall the class viewed Columbus as more bad than good. Hopefully this exercise showed students that history is more complex -- and debatable -- than it might appear at first, and that perspective makes a big difference in how one understands historical developments. Akiba-Schechter first and second grade teacher Jackie Rapp believes that a lesson should be “six feet deep and one inch wide.” What does that mean? By focusing on one topic (one inch), a lot of knowledge and skills can be acquired (6 feet). 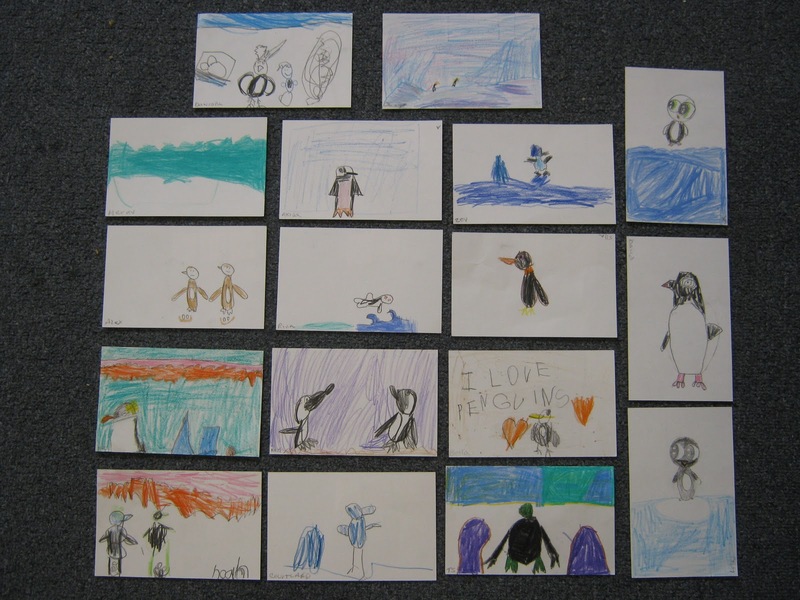 Case in point: Her first and second graders have been studying penguins since early November, and as they dove deep into the topic, they gathered a plethora of knowledge and skills, not to mention that they got the whole school involved and excited about the penguins. Penguins made from two-liter soda bottles. 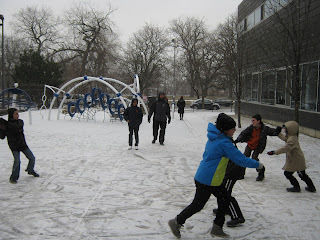 History: Learning about Sir Ernest Shackleton’s fateful journey to the South Pole. 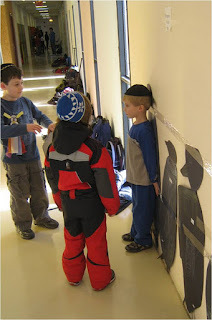 Math: Measuring out life-size models of different penguin species. Biology: Learning how penguins live, what they eat, how they breed, etc. And studying the many different types of penguins! Environment: Learning all about the world the penguins live in. For example, Cape Royds has seen fewer nests over the past few years since an iceberg crashed offshore, causing the penguins’ trip for food to be much longer. Geography: The kids know all about the South Pole now, especially after their flag flew in Antarctica! Science: Learning what it takes to live on the South Pole, not only as a penguin, but also as a human. 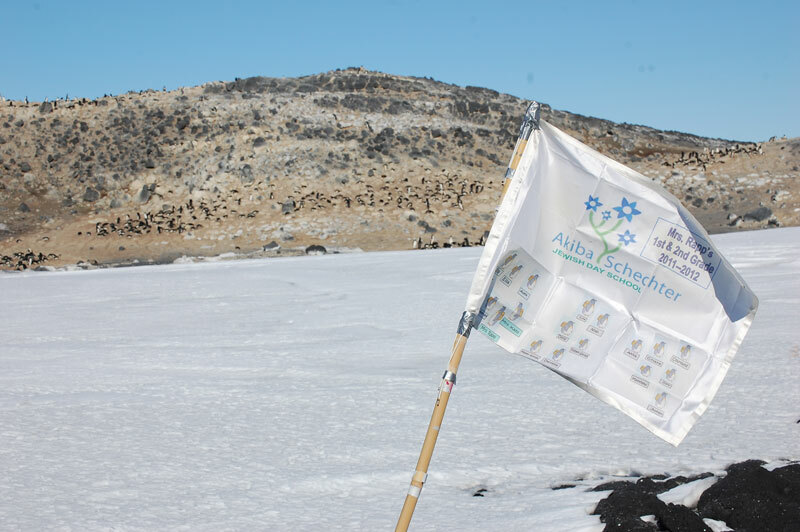 University of Chicago scientist Abby Crites visited the class before leaving on her expedition to the South Pole, and packed the flag that the kids had created. She had the flag fly at the station, then mailed it back. Research skills: Corresponding with Penguin Outreach Coordinator Jean Pennycock, who helped the students understand what they were seeing on their penguin web cams, and of course using Internet sources to read up on penguins and the South Pole. Presentation skills: Presenting all their learning to other classes by giving oral reports and tours of the penguin habitat. Penguin habitat in Mrs. Rapp's classroom. Arts & crafts: Building penguin models out of two-liter pop bottles, and creating a penguin habitat in their classroom. 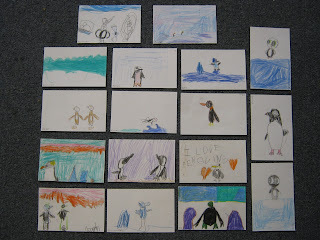 The kids' postcards before they were mailed to Antarctica. Writing: Designing and writing postcards to Ms. Crites in Antarctica, who then mailed them back. Now the kids have their very own postmarks from Antarctica! Empathy & Caring: The kids pooled their pocket money to adopt a penguin in the Falkland Islands, whom they named Snowy. They also got really worried when one of the mother penguins they were watching in Antarctica went missing for a while, and the male penguin had to leave the nest to find food. Thankfully, all is well now, and the kids are ecstatic that the chicks have hatched, and new photos are posted every day on PenguinScience. life-size models of penguin species. 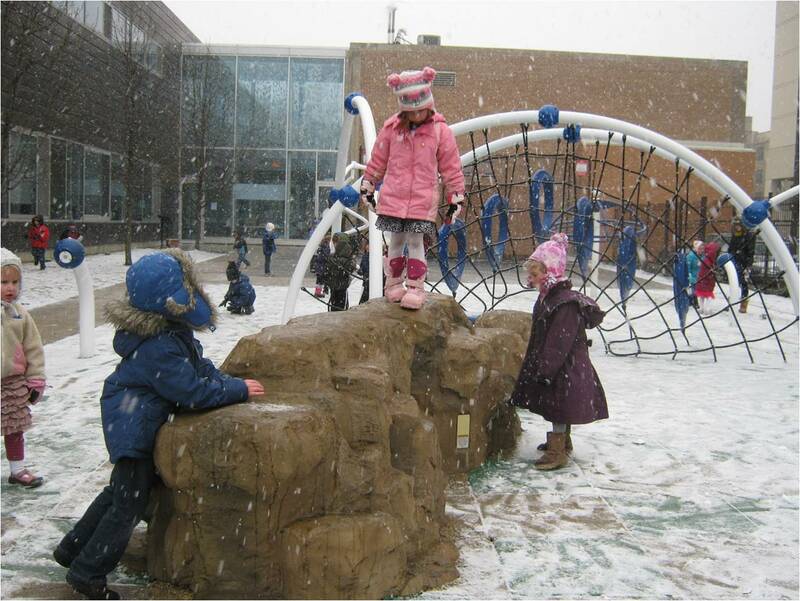 Sharing & Leadership: The first and second graders worked on the penguin models with a pre-school class. As the grand finale of their penguin project, they welcomed pre-schoolers as well as the other elementary grades to their class to share their knowledge, help the other students measure themselves against the penguin models, or give them a history lesson about Shackleton. A student presents the penguin habitat to visitors. 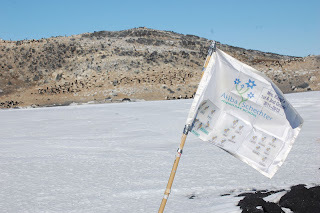 In putting together this blog post, it was hard to even parcel out skills to different activities in this project because they are really all interconnected: Baking penguin cookies entails not only measuring (math), but also working together (teamwork), and decorating (arts & crafts). And building life-size penguin models involves not only math, but biology, and a good amount of dexterity and creativity! So, not only were the kids’ minds engaged in this project, but so were their bodies, and these first and second graders swept up the entire school with their excitement about penguins! The penguin project's focus might be only one inch wide, but it certainly is more than six feet deep.